Typing is an important skill to have. Even if you don’t sit behind a desk, knowing how to type well will open up doors of effortless communication for you. Most “learn to type” programs are boring or geared towards children. ZType is not either of those things. This Space Invaders typing game will make you obsessed with increasing your speed. This is a typing game. 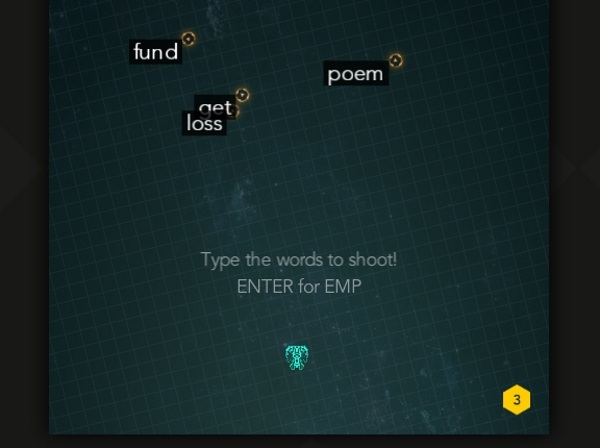 You play a little space ship and you destroy your enemies by typing the words that appear next to them. You have to be quick or you will quickly be swarmed by the waves. The little enemies feature small, common words like the or cat while big “boss” enemies have long words like universities. Also they shoot missiles that can only be destroyed by typing a series of random keys. Hope you remember that from typing class. This game is good for anyone who has the basics of typing down but needs to get more practice. Or anyone who just like Space Invader type games. Ztype is free.